This is a MUST-HAVE for a Ford Mustang Owner! You are buying the BEST manual money can buy! This is the same manual the Dealership mechanics & the local repair Shops use to diagnose & repair you vehicle. This manual allows you to save money by providing the specs & information needed so you can perform anything …from a simple repair to re-building the entire engine. Even if your vehicle has no issues right now, you can always be ahead of the game for any future needs & have immediate access & knowledge of all internal aspects just like the dealership mechanics have. · Step by step instructions. · Do It Your Self & save money! · Every page is printable. · Easily print a page & take it with you as you working in the garage or workshop. · Insert the CD in your laptop's CD-ROM & you have immediate access anywhere. THIS IS NOT A BOOK PAPERBACK MANUAL! 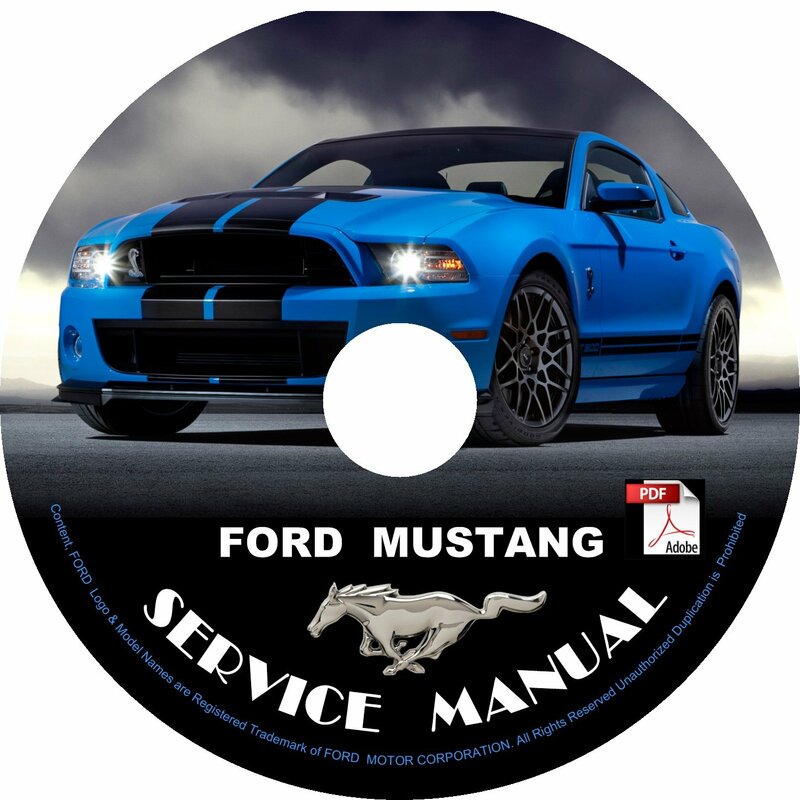 This is a digital/electronic manual on CD that is year specific for your car. Electronic manual means that is not a paper/book manual; you simply use your computer to view the files. · With the Adobe pdf electronic format you can zoom in/out of the page to view text & pics in larger size for a more detailed view. · You can print 1 page at the time or as many pages as you need & take it with you as you working in your garage or workshop. · Indexed & searchable to save you time. THOUSANDS OF [pdf] PAGES OF INFORMATION.! The manual covers 2010-2012, years: 2010 2011 2012. ·	More than 4,100 pages on this manual. ·	The manual covers 3.7, 5.0L & 5.4L engines. ·	Clutch Disc & Pressure Plate (Removal). ·	Blower Motor Resistor (Removal). ·	Climate Control Assembly (Removal). ·	Cooling Fan Motor & Shroud (Removal). ·	Disk Brake System (Removal). ·	Door Trim Panel (Removal). ·	Drive shaft Universal Joint (Disassemble). ·	Evaporative Emission Canister Purge Valve (Removal). ·	Front Disc Brakes (Removal). ·	Front Disc Brakes (Specifications). ·	Front Seat Backrest (Disassembly). ·	Front Seat Cushion (Disassembly). ·	Front Subframe & Components (Removal). ·	Front Suspension Lower Arm (Removal). ·	Fuel Lines & Filter (Removal). ·	Fuel Tank & Filler Pipe (Removal). ·	Fuel Vapor Control Tube Assembly (Removal). ·	Inner Tie Rod (Removal). ·	Mode Door Actuator Air Inlet Door (Removal). ·	Mode Door Actuator Defrost Door (Removal). ·	Mode Door Actuator Panel-Floor Door (Removal). ·	Parcel Shelf Speakers (Removal). ·	Parking Brake Cable Adjustment. ·	Positive Crankcase Ventilation (PCV) Valve (Removal). ·	Power Steering System (Removal). ·	Electronic Power Assist Steering (EPAS). ·	Powertrain Control Module (PCM). ·	Quarter Panel Speaker (Removal). ·	Rear Disc Brakes (Removal). ·	Rear Drive Axle Differential Ford 8.8-inch Ring Gear. ·	Rear Lamp Assembly (Removal). ·	Rear Quarter Trim Panel Convertible (Removal). ·	Passive Anti-Theft System (PATS). ·	Keyless Entry & Alarm. ·	Rear Seat Backrest (Removal). ·	Rear Seat Backrest Coupe (Disassemble). ·	Rear Seat Cushion (Removal). ·	Rear Suspension Lower Arm (Removal). ·	Rocker Panel Molding (Removal). ·	Schematic Fuse & Relay Information. ·	Schematic Horn & Cigar Lighter. ·	Schematic Message Center Plug. ·	SRS Airbag De-powering & Re-powering. ·	SRS Driver Airbag Module (Removal). ·	SRS Passenger AirBag Module (Removal). ·	Temperature Blend Door Actuator (Removal). ·	Thermostat & Thermostat Housing (Removal). ·	Transaxle MT82 Getrag 6-speed. ·	Transmission Fluid Drain & Refill. ·	Transmission Fluid In-Line Filter. ·	Transmission Fluid Level Check. ·	Wheels & Tires (Diagnosis). · The CD manual is in English. · Works on Windows PC’s & Mac.